Vera Scroggins of Susquehanna County, Pa., will be in court, Monday morning. The last time Scroggins appeared in the Common Pleas Court in October, she didn't have lawyers. That's because Judge Kenneth W. Seamans refused to grant her a continuance. When she was served papers to appear in court, it was a Friday. On Monday, she faced four lawyers representing Cabot Oil and Gas Corp., one of the nation's largest drillers. Seamans told the 63-year-old grandmother and retired nurse's aide that to grant a continuance would inconvenience three of Cabot's lawyers who came from Pittsburgh, more than 250 miles away. He also told her she might have to pay travel and other costs for the lawyers if she was successful in getting a continuance. Scroggins agreed that she used public roads to get to Cabot properties. For five years, Scroggins has led tours of private citizens and government officials to show them what fracking is, and to explain what it is doing to the health and environment. But she was always polite, never confrontational. And when she was told to leave, she did, even if it sometimes took as much as an hour because Cabot security often blocked her car. 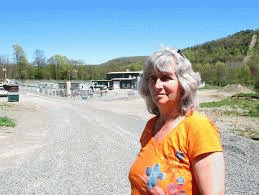 Cabot personnel on site never asked local police to arrest her for trespassing. In court, Scroggins tried several times to explain that while near or on Cabot drilling operations, she had documented health and safety violations, many of which led to fines or citations. Every time she tried to present the evidence, one of Cabot's lawyers objected, and the judge struck Scroggins' testimony from the record. Cabot acknowledged Scroggins broke no laws but claimed she was a "nuisance." Scroggins tried to explain that she put more than 500 short videotapes online or onto YouTube to show what fracking is, and the damage Cabot and other companies are doing. Again, Seamans accepted Cabot's objection, and struck her testimony. And that's why Cabot wanted an injunction against Scroggins, one that would forbid her from ever going anywhere that Cabot has a lease. It had little to do with keeping a peaceful protestor away; it had everything to do with shutting down her ability to tell the truth.